Sir, as you and I are in a manner perfect strangers to each other, [and] As you proceed further with me, the slight acquaintance which is now beginning betwixt us, will grow into familiarity... Therefore, my dear friend and companion...,—bear with me,—and let me go on, and tell my story my own way:—or if I should seem now and then to trifle upon the road..., don’t fly off,—but rather courteously give me credit for a little more wisdom than appears upon my outside;—and as we jog on, ...do any thing,—only keep your temper. The Morrowind book A Dance in Fire by Waughin Jarth is a ripping good yarn about a laid-off company worker, Decumus Scotti, who is too young to retire but too old to consider a career change. He is lured by a friend to enter a war Zone to negotiate reconstruction contracts as—shady—free agents. The venture ends in disaster as his building materials and construction contracts are burned by rampaging Khajiiti soldiers, and Scotti must make his way through a hostile no-man's-land to meet up with his friend in Silvenar. There Scotti meets the Silvenar of Silvenar and negotiates hundreds of lucrative construction contracts using “borrowed” stationery from the rival Vanech Building Commission. “Scotti’s Revenge” was by far the most difficult to write and, therefore, by far my favorite story. It was in 2008 when I wrote it for a fan fiction site that has since withered on the vine. In it, stories were ranked by popularity with the most “Likes” at the top and the newest way down at the bottom. Some writers had found a way to game the system to stay permanently at the top, so I never got more than two or three genuine Likes because readers had to scroll through several hundred titles before they got to mine. I finally decided I had better things to do. 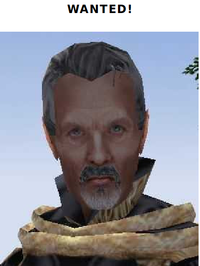 However, I still had a few stories filed away in my hard drive and in my head, and this year (2016) I googled “Morrowind fan fiction” just as a lark, and at the top of the list was the UESPWiki fan fiction page. I definitely liked what I saw—no popularity contest for one and strict control for another. So I rummaged my head for “Scotti’s Revenge” and “The Adventures of Laila” and reconstructed them as one story. The former story had Scotti enlisting Laila’s aid in taking revenge against the Silvenar for his barbaric treatment of Leodes Jures, after which they rub out Vanech—and then they live happily ever after when they are reunited in “The Adventures of Laila”. The problem was it made knocking off the leader of Valenwood look too easy, and one crucial element in a story is plausibility, especially when it comes to romantic relationships. They are really difficult to describe without getting mawkish and treacly. 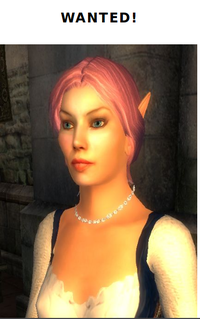 The latter story had Scotti and Laila going their separate ways (but I can’t remember why), and Laila is in Seyda Neen where she meets a young Bosmer who has to go meet Caius Cosades. In dire need of training, he submits to her mentoring, but he rashly gets himself killed in the Ilunibi cavern. Cosades agrees to let her stand in as the Nerevarene, and she is confirmed in the Cavern of the Incarnate, where she also meets the spirit of the young Bosmer and tearfully apologizes for what happened. I still wanted a Nerevarene in the background of the new story, so Laila was replaced with Yumiya. I’ve done my best to make this story as concrete, palpable, and believable as possible, and I truly hope it will knock your socks off! One Laila 2016 Scotti compels his boss to send him back to Silvenar, but that's not what the boss has in mind for him. Two The Other Woman 2016 Scotti meets a sassy young woman on the prisoner transport ship and wishes he was single again. Three A Brief Intermission 2016 Yumiya has a chance encounter with her Deus ex Machina, who gives her a pep talk. Four Parting 2016 The authorities are closing in, and one decides she's already had enough of this. Five Getting Even 2016 The other decides he's had enough as well and wants to come clean. Six An Unexpected Letter 2016 Yumiya reestablishes contact with Scotti anticipating his release from prison. This page was last modified on 24 December 2017, at 01:21.